Friedrich Abel Karl: (b Cöthen, 22 Dec 1723; d London, 20 June 1787). Composer and bass viol player, son of (2) Christian Ferdinand Abel. He was no doubt a pupil of his father’s, especially for the bass viol; but on his father’s death in 1737 Carl Friedrich may have turned to the former relationship with the Bach family and gone to Leipzig to study, as Burney, who knew Abel, stated. By 1743 Abel was a player in the court orchestra under Hasse in Dresden; the connection with the Bachs was maintained – W.F. Bach was an organist there until 1746, and J.S. Bach had held an appointment as court composer from 1736. Abel left Dresden in 1757–8 during the destruction of the city by Frederick the Great. He then travelled, visiting the house of Goethe’s family in Frankfurt and probably the musical centres of Mannheim and Paris. He had already begun to compose in Dresden; the Breitkopf catalogue of 1761 advertises solo and trio sonatas and concertos, all with the flute, and describes Abel as a chamber musician to the King of Poland. During the 1758–9 season Abel went to London, the city where he was to spend most of his remaining years. His first public concert there was on 5 April 1759 (a few days before Handel’s death). Abel demonstrated his versatility by performing on the bass viol, the harpsichord, and Sir Edward Walpole’s newly invented pentachord, as well as being the composer of most of the music. Over the next five years Abel increased his reputation in London through his own annual concerts and through his direction of the concerts of other artists. In 1760 he was granted a royal privilege for the publication of his music in London; while publishing his early works there on his own account, he ensured his continental reputation by selling his op.1 to Hummel and his opp.2 and 3 to Breitkopf. The association with J.C. Bach began late in 1763, and the first sign of their joint efforts was a concert on 29 February 1764; thus the relationship of the Bach and Abel families continued. Both men were appointed chamber musicians to Queen Charlotte in about 1764, posts they held to their deaths; both were also friends to the Mozarts during their visit to London (1764–5) and served as mentors to the young Wolfgang. Abel’s Symphony in E op.7 no.6 was copied by Mozart and was long regarded as Mozart’s work (formerly k18). The association between Abel and Bach led to the establishment of the Bach-Abel concert series. This annual series of 10–15 concerts began on 23 January 1765 and continued up to 9 May 1781. They began as part of Mrs Cornelys’s entertainments at Carlisle House, Soho Square, and moved in 1768 to Almack’s Great Room, King Street, St James’s. Their success encouraged Bach and Abel to enter into partnership with G.A. Gallini, a retired dancer and brother-in-law of Lord Abingdon, to build their own concert room in Hanover Square. 1775, when that hall opened, marks the zenith of the Bach-Abel concerts, for in addition to the series there they offered 11 oratorio evenings at the King’s Theatre, with new works in the sinfonia concertante form proving a popular attraction. The opening of the Pantheon concerts in 1774 gave rise to an element of competition that doomed the complacent Bach-Abel series. The decline was no doubt hastened by Gallini’s rival series at the Hanover Square rooms on another night. Bach’s death at the beginning of 1782 might have ended the faltering enterprise, but Abel managed to continue the concerts under his own name for the rest of the season. Strangely, Bach’s widow declined Abel’s public offer of assistance. Possibly the relationship between Bach and Abel had by then become no more than a business matter; after sharing a home for many years, they had found separate residences in 1771, and unlike his flamboyant partner, Abel seems to have led a quiet and well-ordered life. Abel’s contribution to the Bach-Abel concerts included the direction on alternate evenings. The concerts introduced to London many musicians from the Continent, and while Bach’s influence can be seen in the choice of singers, many of the instrumentalists had known Abel at Dresden or his brother at Ludwigslust. Abel seems to have visited Paris with some regularity in the 1770s and 1780s; he was said to be teaching the viol to a fermier-général there, and it was probably he who introduced the several performers from Paris featured at the concerts. The directors also supplied most of the music that was given; much of it must appear among Abel’s published symphonies, concertos, quartets and trios. Those and his keyboard sonatas designed for the amateur were published from 1765 by Robert Bremner, who thereafter issued the first editions of almost all Abel’s works and reissued those that had been printed before that date. At this time Abel was highly regarded as a performer on the bass viol, and at most concerts he displayed his talents in a solo or concerto. The concerts Bach and Abel gave at court (for example one for the Prince of Wales’s fifth birthday on 12 August 1767) were in a sense an offshoot of their series; their influence is also seen in the number of individual benefit concerts that they were asked to direct both in London and in nearby cities during the summer. The programmes of these events serve as a good guide to the music played at the Bach-Abel series, the programmes of which are not extant. At the end of the 1782 season Abel left London to visit his homeland. He saw his brother in Ludwigslust and probably his younger brother Ernst Heinrich (who was to claim Abel’s possessions after his death) in Hamburg. He also spent some time at the court of Friedrich Wilhelm, Crown Prince of Prussia, at Potsdam; Abel had dedicated his op.15 quartets to the prince in 1780, and now he so impressed with his viol playing that he received 100 louis d’ors and a gold snuff-box. The manuscripts of five of his symphonies were (until 1943) in the Berlin Stadtsschlossbibliothek, which suggests that he composed them for the prince, possibly on this visit. An advertisement in Cramer’s Magazin der Musik (25 February 1783) shows that manuscript copies of his sonatas and quartets for the gamba were in circulation. From the beginning of 1785 until his death Abel was again active at the Hanover Square rooms. He was billed as principal composer and viol player to the Grand Professional Concert, successor to the Abel concerts of 1782 that maintained much the same personnel as the Bach-Abel series; but the new symphonies performed there (perhaps the Berlin set) remained unpublished. His last concert appearance was as a bass viol virtuoso in a benefit for Mrs Billington, the daughter of Bach’s pupil Mrs Weichsell, on 21 May 1787. That final concert represents an act of generosity typical of the warm-hearted Abel, who often gave concerts for the needy and helped to introduce young performers. The most famous among those whose careers he furthered are the cellists John Crosdill and James Cervetto, for whom Abel provided a showy duet in 1778. With the violinist Wilhelm Cramer and the oboist J.C. Fischer, they formed the core of the Bach-Abel troupe for many years. Cramer’s son, the pianist Johann Baptist, later publicly acknowledged Abel as one of his composition teachers, but it seems that Abel had no other famous pupils for either composition or the viol. His generosity was equalled by the strength of his attachment to his friends, among whom was the painter Thomas Gainsborough; the friendship resulted in an exchange of music and paintings – Gainsborough’s magnificent portrait of Abel with his gamba (see illustration) was exhibited at the Royal Academy in 1777 and is now at the Huntington Library, San Marino, California (other portraits of Abel include one by Robineau in the royal collection and an anonymous painting in the Music School at Oxford). Abel appears to have had a particular fondness for art and artists, for in addition to his collection of Gainsboroughs he cultivated the friendship of the designers and engravers Bartolozzi and Cipriani. He was also good friends with the Mannheim violinist Wilhelm Cramer, and the two shared an apartment before Cramer’s second marriage, from 1776 to about 1779. It was at this time that Abel first showed signs of the illness that was to kill him; it was apparently brought on by rich living and in particular by an over-indulgence in drink, but it seems impossible to link this with any tragedy in his life (as has been suggested). Up to the time of his death Abel maintained a highly respected position in London society, at court, in the homes of the nobility, in fashionable circles, and among his fellow musicians; the several obituaries were unanimously laudatory. Abel’s reputation as a performer is closely connected with the bass viol. He also played the harpsichord well, but references to his performance on the french horn are the result of his admiration for a keyboard sonata by Ferdinand Horn which he must have played either on the harpsichord or in an arrangement for solo bass viol. That instrument was by this time approaching the end of its history; Abel’s obituary in the Morning Post of 22 June 1787 remarked that ‘his favourite instrument was not in general use, and would probably die with him’. It still had players in amateur circles; and in his last ten years Abel experienced in London the professional competition of Andreas Lidl. His playing may have been slightly influenced by the possibilities of the cello; the only direct evidence of his style comes from the obbligato to an aria from Sifari, performed with Guarducci on 5 March 1767, which consists of an expressive cantabile in the upper register with few chords. The several pieces for solo bass viol now in the New York Public Library exploit the instrument’s resources more fully and in virtuoso fashion, especially in the rich adagios and in one fugue; these works may have been written for a pupil rather than for Abel’s own performance. Most of the rest of the surviving literature was obviously intended for amateurs, which perhaps implies that Abel’s own performances were usually improvised; Burney wrote: ‘I have heard him modulate in private on his six-stringed base with such practical readiness and depth of science, as astonished the late Lord Kelly and Bach, as much as myself’. Abel was especially praised for his refinement of taste and his depth of feeling in adagios. He did not emphasize technical display in his performances; Burney commented that the ‘most pleasing, yet learned modulation; the richest harmony; and the most elegant and polished melody were all expressed with … feeling, taste and science’, and that his manner of playing an adagio soon became a model for string players. Abel was primarily a composer of instrumental music; his few vocal pieces are relatively unimportant. The symphonies, sonatas and bass viol pieces form the largest groups among his output. 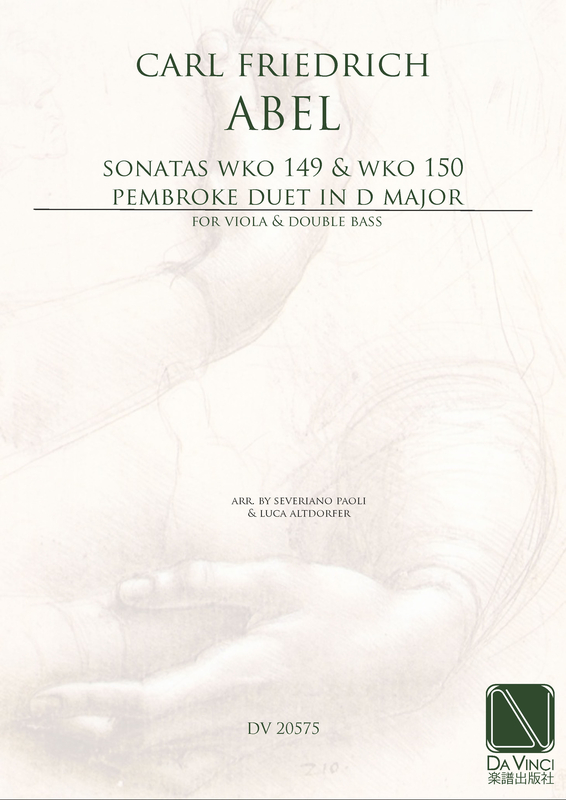 Abel’s style underwent little change; although he eventually came to write bass lines free of the plodding continuo style, the texture of two parallel melodic voices with a supporting bass, derived from the trio sonata, can be found in most of his trios and in many of his quartets and symphonies. Most of his works are in three movements, the remainder in two. Abel’s music is generally genial, energetic and light-hearted. He rarely used minor keys, and there is little trace of deeper emotion or Sturm und Drang, although his harmonic style is exceptionally rich and expressive. His melodies are often markedly instrumental in character, with broken chords, syncopation and appoggiaturas as common features; but he had a penchant for phrases of unusual lengths, and some of his music is refreshingly free from the two- and four-bar unit so common in the pre-Classical period. The slow movements usually have elegant, lyrical, highly ornamented melodies of considerable breadth; his finales are commonly in dance rhythm, often minuets (sometimes with variations but rarely with trios) or rondos. The result is a refined, urbane version of the Mannheim style with perhaps an Italian influence evident in the more vocal melodies and lighter moods. Burney remarked that his ‘invention was not unbounded, and his exquisite taste and deep science prevented the admission of whatever was not highly polished’; he commented on a certain languor, and praised his harmony and ‘selection of sounds’ as models of perfection.